a tasty combination of colourful vegetables in a chinese blend that goes well with noodles as well as fried rice.non vegetarians can replace the vegetables with minced chicken dumplings. dice the carrot,beans and capsicum.slice the mushrooms lengthwise or as u like. heat oil, add the sugar and keep stirring on medium to caramalize lightly. add the ginger garlic paste and onions and saute well. 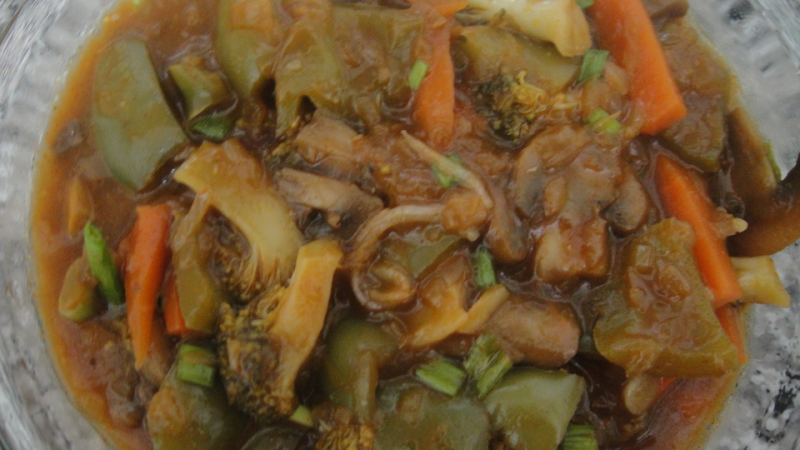 add also both the sauces,aji-no-moto,and the vegetables including the broccoli. season with salt and white pepper powder.if u need more spice add the red chilli powder also. mix well and pour water and cook till vegetables are done. add the cornflour and stir in till saucy and well cooked.